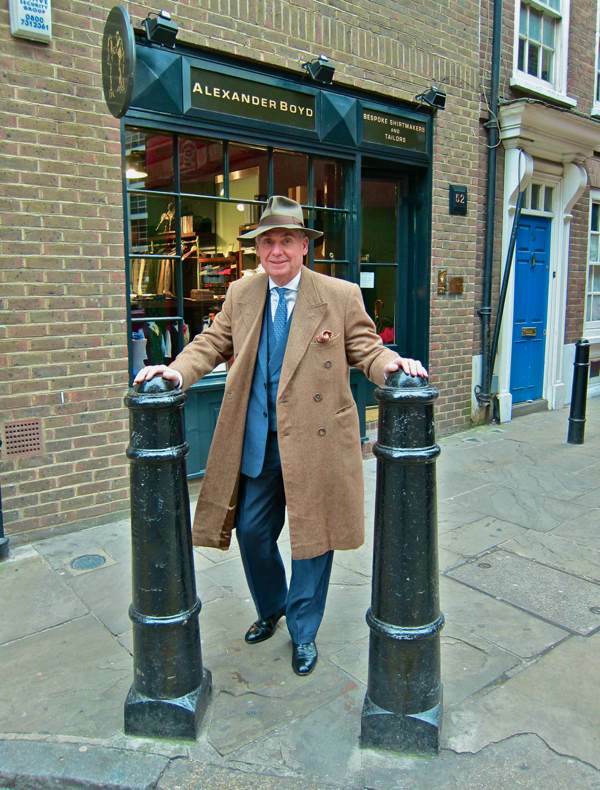 With the dress-sense of Cary Grant and the swagger of Captain Hook, Robert Boyd-Bowman – known universally as “Boyd” – is a familiar figure in Spitalfields. A gentleman for whom the word “dapper” might have been invented, he is also a celebrated raconteur. When you engage Boyd in conversation, you never know where it may lead, because he has lived so many lifetimes that stories simply come tumbling out of him. You had better keep up, because Boyd is equally likely to be popping off to New York or out for a nice lunch, or taking a trip down to his tailoring workshop in Bow, or his shirt factory in Chatham, or flying to Rome to show his new tie collection. A fearless entrepreneur with impeccable manners, Boyd – the proprietor of Alexander Boyd – possesses an ebullience that has carried him through a string of professional disasters during a rollercoaster career in business. A lesser soul might have descended into cynicism, yet for Boyd these events have had the opposite effect – sharpened his resolve to discover what has true meaning for him. And the unlikely outcome is that Boyd has become a champion for the cause of making things in England, seeking ways to keep traditional skills alive in this country. 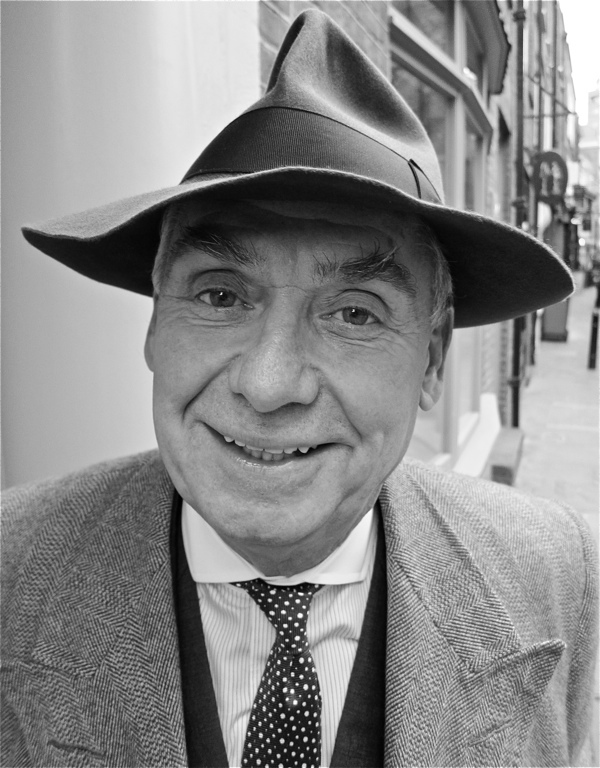 “I opened my first office in Duke St, St James at the age of nineteen, I heard that Fortnum & Mason did the best squeezed orange juice in the morning so I thought it would ideal to have an office just around the corner. I only had one job in my life – my father and godfather got together and decided “The boy’s not very bright, so we’d better get him a job in the City.” At seventeen and a half, I was an insurance claims broker at Lloyds but after four months my line manager told me, “We don’t work like that here.” I was working too hard, but my had father told me when I started the job, “You be on time, you work as hard as you can and you leave when they let you.” It was unbelievable! At that point, I realised you can’t make money working for other people. I grew up in Kensington in a lovely house in Warwick Gardens with a big garden, and even though we’re talking about the nineteen forties, I felt I was brought up in the Victorian era. As an only child, I had to entertain myself, so I started off with golf balls. I always broke the basement window and it was taken out of my pocket money which meant I went off to prep school with nothing each term. I needed a few quid, so I bought bits and pieces from boys that were leaving and sold them to those that were arriving. I did a bit of trading. My father got concerned because he couldn’t figure how I always had money, so he asked the headmaster to keep an eye on me, in case I was becoming a thief. After I left the City, I found a job selling dry powder fire extinguishers. You sold on the road. I just knocked on doors. I knew I could sell anything. I was part of a team – a supervisor and five salesmen.The supervisor bought the extinguishers and sold them to the salesmen, the more you bought, the cheaper they were and the greater the commission you earned. The aim of the exercise was to get to be a supervisor, so you were taking a commission off everybody. We were selling a lot of these extinguishers, they were ideal for cars and no-one had thought of that before. It was up to the moment, until the Ministry of Defence decided to sell off a lot of these things after the war. Nobody knew if they worked until it came to use them and unfortunately these had set solid – no longer dry powder but cement! There were tragic news stories, and that was the end of the industry. You could never sell another one on the road. Next we sold water heaters, it was a bloody brilliant idea – in the sixties there were a lot of homes that didn’t have hot water. This heater had electrodes and all you had to do was attach it to the pipe somewhere near the tap and plug it in. They sold well and the Financial Times did a fantastic article. However, the copper electrodes were expensive and the people up in Birmingham who were manufacturing them substituted something else, and they blew up. We should have been selling the fire extinguishers after the water heaters, not the other way around! Then I went into the textile business, with a man who was a leather maker – a Frenchman. We had this factory in Rampart St in the East End and we started selling suede and leather clothing. 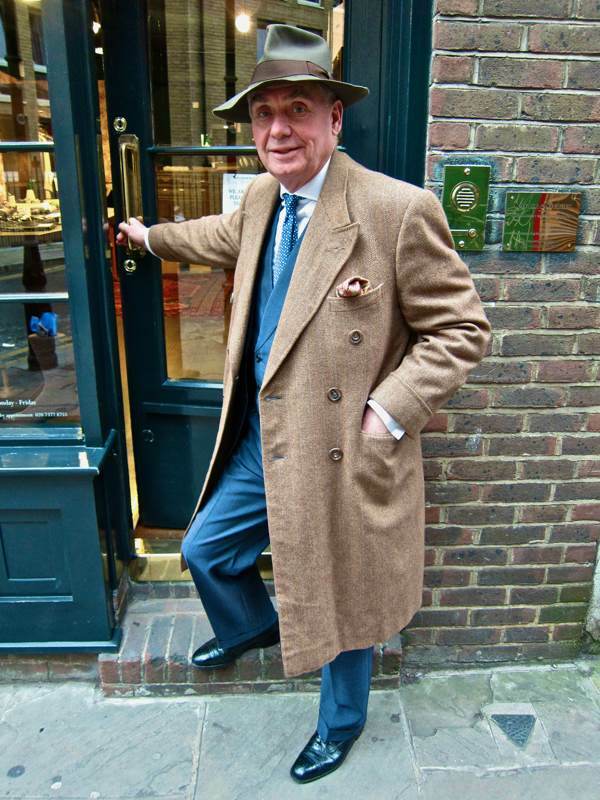 Within a year, we had a whole building in Bond St with showrooms, offices and a cutting room on the top floor. We were doing very well and we opened another factory in the East End in Arbour Sq, and I went to Spain to buy more production – and when I came back my partner had disappeared with all the money. He was a big gambler and he lost a lot. We had to close the place down and sell the stock, and there was this man who came in to buy it all. So I said to him, “I can sell but I don’t have any money and you have a lot of merchandise.” He agreed to let me sell it and I filled up suitcases with stuff in his warehouse in West Kensington. I didn’t have a car, so I put an advert in the evening newspaper for a chauffeur at twenty pounds a week plus expenses and I had lots of replies. They had to be in livery and have a decent car. We packed the car with suitcases of clothes on Monday but I didn’t know if I’d be able to pay the guy on Friday – I let him put the petrol in the car. So either I had to do a runner or be able to pay him, but at the end of the first day I’d cleared enough to pay him and his petrol, and I still had four days left to run. In those days, buyers in each department of big stores bought their own stock on the shop floor and at the end of the first week I’d cleared a hundred quid, which in 1965 was equivalent to three grand today. I was back on track, although the driver turned out to be a gambler. All these people were gamblers. At the end of five years, I went back to my supplier and said I want a piece of the action, but his partner didn’t want it so that’s when I headed off on my own. I bought an interest in a diamond manufacturer in Antwerp and became a dealer on the diamond bourse. I found it was difficult to sell anything in Europe at that time, there was the first oil crisis and the Bader Meinhoff gang. So I moved to Hong Kong which was a diamond centre but, even though it was a free port, you had to deal with states that were military juntas. I got involved in the Philippines with a client who wouldn’t pay and I had to underwrite the debt personally, and it wiped me out. I came back to England and the only business I knew was the job stock business and fortunately I had an aunt who left me a couple of grand, and I took the money and invested in the stock market and made many thousands more. I bought dead stock in bulk from East End clothing factories and resold it. Being out in the Far East, I realised that China was going to be admitted to the World Trade Organisation and I could see that we were going to be swamped by cheap imports. A lot of clothing that had been produced in the United Kingdom was going to made offshore in future. It was already happening in the seventies. I could see it would leave some smaller players who wanted to carry on making in England, and this was when I started getting involved with manufacturing in England to cater for retailers who I knew wanted this. The “Made in England” label has always imparted a certain gravity and I thought it would be a shame to see it go completely, as if it never happened. I realised I had to get involved in the top end of the market, because you can’t compete with China and the Far East for price. They can reproduce things, but they can’t make English shirts since ours are made by hand whereas theirs are made by machine. A shirt that is made by hand requires particular skills and it will look completely different. Now, we’re doing better than we’ve ever done before, because the world wants products that are “Made in England.” It is an international signal of good taste. You never ask an Englishman about his tailor, his shirtmaker or where he gets his shoes made, but the rest of the world wants a label. And England is pre-eminent in the world for the quality of tailoring. The worst thing for us is that people don’t recommend us because they want to keep it a secret. Everybody else puts the label where you can see it when you open the jacket, but we sew ours inside the pocket where no-one can see it. A brand tells one story, but the clothes we make tell their own stories. In the end, you start to do things for enjoyment rather than monetary gain, it becomes about making people happy, making something for people that appreciate it. This guy’s early years selling fire extinguishers and heaters sound like something out of Julian McLaren-Ross’s ‘Of Love and Hunger’: brilliant book, thoroughly recommend it to anyone interested in 1940s and 50s. Really entertaining post. Mr Boyd sounds like a total character and I thoroughly approve of his Made in England aesthetic. If Britain wants to get its economy back on top, that’s the way we need to go: high quality British manufacturing. Remember us? Names from the past, Belsize Boxing and Warwick Gardens! We were just talking about you and wondered what had happened to you! Get in touch for the sake of auld long syne!